Cancelations made fifteen (15) or more days prior to the date of arrival will incur a 10% charge of total reservation amount. Cancelations made three (3) to fourteen (14) days prior to the date of arrival will incur a 80% charge of total reservation amount. Children: 4-12 years old, welcome. 10 min. from Santa Marta’s Airport, you can get there by car or city taxi. Situated on a pristine tropical dry forest surrounded by Santa Marta Snow Mountain Range, lies Mamancana Private Game Reserve. A conservation project dedicated to wildlife rehabilitation, awareness and preservation of bio-diversity. With over 14,500 acres of land, we share our space with a host of wild animals and different plants species and through careful management of the environment have encouraged the return of many endemic species. Over the past 25 years we have been working hard to preserve our land to be able to offer our guests the opportunity to experience the varied, yet specialized eco-systems that call Mamancana Mountain home. Mamancana is a unique and exclusive multifunctional ecotourism project featuring a restaurant-bar, Wellness Spa, infinity pool, outdoor activities, a luxury private lodge and diffrente tents for glamping. Live a GLAM experience in which you can sleep in the middle of the woods and enjoy the sounds, the stars and feel the energy from the Snow Mountain Range of Santa Marta. 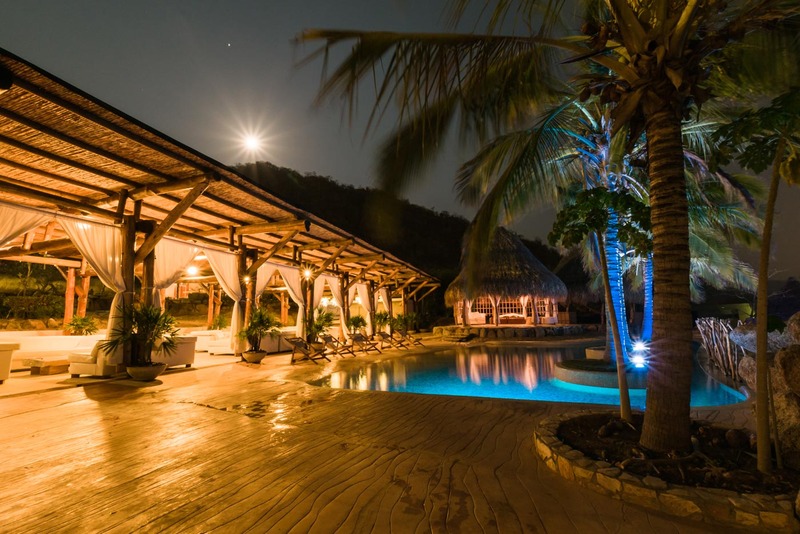 Stay in a Tayrona cosmic model where you can connect with the most spiritual of your being. Each of the 7 Choza has a Queen bed, portable lamps, towels, blanket and one shared bathroom. ONLY AVAILABLE FOR GROUPS OF 10-14 GUESTS. This place is an invitation to submerge among the nature through the rustic luxury experience of a private lodge. With the ancestral design define by the use of stones , wood, and straw, this spacious structure offers a truly indoor/ outdoor experience , as well a bit more seclusion to get away from everything. 4 bedrooms, 2 bathrooms. $390 per night up to 4 people & $593 up to 8 people. Stunning glamping day and night! What to bring : cash, bug spray, sunscreen, sandals, hiking boots.